If it’s any consolation, your quarterly water bill is less than mine over three months (mine gets added to the rent each month). It was actually estimated but I can’t be bothered to go out in the cold and dark to read it. They’ll read it next time! It averages out about £10 more, which still isn’t too bad. Just estimated? Your true love sounds lazy. You never know what may show up…I am still hoping for the pipers to show up here! Yeah, I know, right? How hard is it to pop round and lift a little metal cover up? Good luck with the pipers! Yes I have! I was all excited that I had finished shopping early and remembered everyone. Except I forgot about Car Insurance!!! 😦 dang! broker than I thought… at least the food is bought and the gifts are wrapped. Woohoo!!! At least you got the food and presents bought! I pay everything else by direct debit so the water bill always takes me by surprise. But yea so excited that I’m not scrambling to get presents now. (that would be the norm). Yeah, no comparison really. It’s not a lot when you consider what they have to do to get it to me. A lot of water gets lost via leaks here as well. They discovered that some of the pipes in London were so old they had completely disintegrated and the water was just running through the hole that was left! 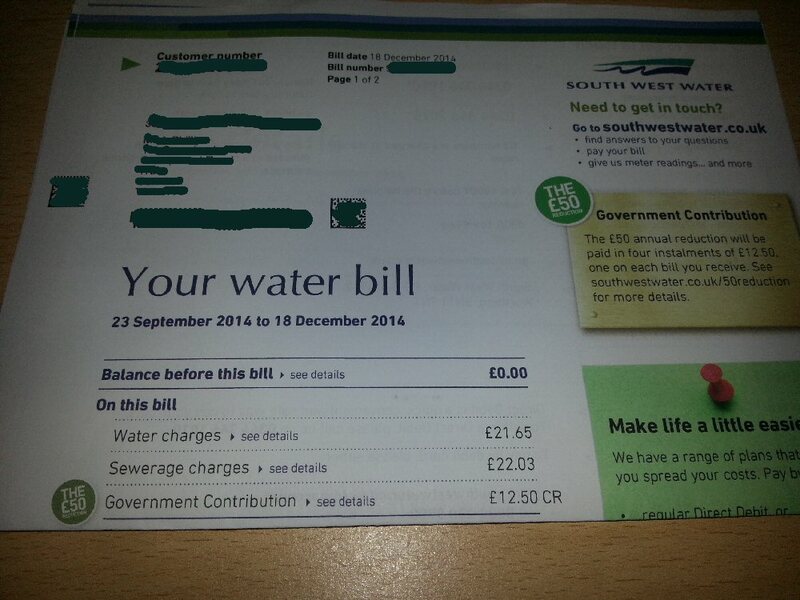 I must be living under the wrong government… they don’t make any contribution to my water bill! It’s a special thing for Cornwall. The water companies are responsible for all non-privately-owned coastline and although some of the Cornish coast is owned by the National Trust that still leaves a lot. Because Cornwall has so much coast (it’s a peninsula basically), that means that our water bills are massively higher than other, much richer parts of the country. I got a text earlier and thought it might be someone wishing me a merry Christmas. It was one of my Visa cards kindly inviting me to pay my bill. Don’t these people know it’s Christmas? All the rest of the country’s post is suffering backlogs and delays, but somehow my water bill made it through. Yea reality rolls right on in.